It’s totally possible to exercise your dog effectively when you have a busy schedule. I work four ten-hour days per week I also have private clients on my “weekends” and enjoy doing things like sleeping, going to restaurants, and writing blogs. 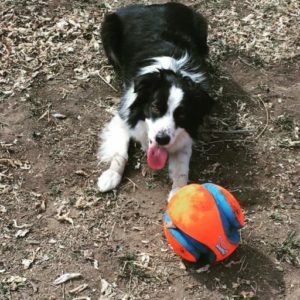 So how the heck do I keep a very athletic 3-year-old border collie happy and healthy? This is a sample week that shows how to exercise your dog effectively. It’s what I did last week, and it works. Feel free to use it to create a similar plan for your dog! It does look like a lot – but keep in mind that I’m training for a marathon and Barley is super high energy. Much of the running could be eliminated if you and your dog don’t fall into that category. Try to use a variety of physical exercise (running, walking, fetch, tug, and hiking) as well as mental exercise (Kong wobblers, stuffed Kongs, training, and find-it games) to exercise your dog effectively. Remember that relying too heavily on things like fetch can actually increase cortisol levels and feed back into some behavior problems. Read on for an explanation of each type of exercise and ways to cut time further. Get the PDF of this schedule here. Have a dog that doesn’t like fetch? 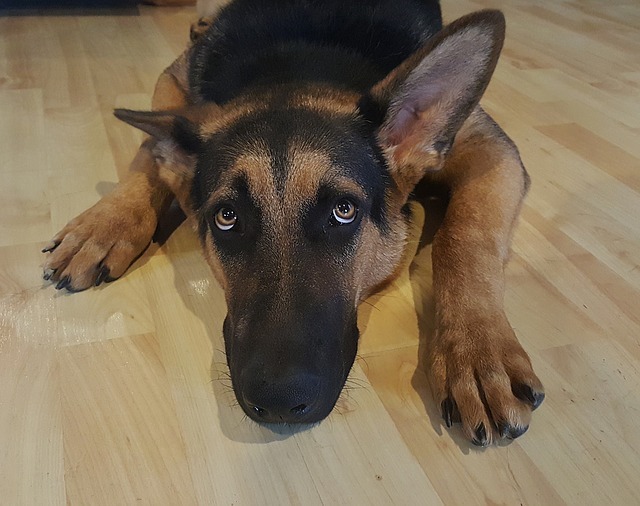 Try this variation to exercise your dog effectively anyway! Don’t need nearly this much exercise? I made a sample schedule for less active dogs and owners, too! Note that I count up time a little differently at the bottom. I do not count walks, hikes, or runs as “Time Spent 100% on Dog” because they are exercise for me as well. I often talk on the phone or meet up with friends for these activities, too. I also don’t count time spent with mat training or stuffed Kongs because I’m multi-tasking at that time. Walks with breakfast in the treat pouch: put your dog’s dinner into a treat pouch. Pick out a few simple skills to work on during your walk. I reward my dog for looking back at me as well as for ignoring distractions like dogs, people, bikes, and squirrels. Cut down time by talking on the phone or listening to podcasts while you walk. We’re already combining a walk with training! Be sure to give your dog some time to sniff as well. Don’t be in obedience mode 100% of the time. Kong Wobbler: I use a Kong Wobbler instead of a food bowl on the days that I don’t train. Stuffed Kong: I have 4 Kongs and usually have 3 stuffed and frozen in the fridge. I toss them to my dog when I’m on my way out the door or to keep him occupied while I’m doing other things. Fetch: This is pretty self-explanatory. Don’t have a fetcher? That’s ok. Just replace fetch with tug, come when called practice, or another walk. I often talk on the phone or listen to podcasts while we play fetch. Find-it Games: I have a set of boxes that I hide treats in. Other days, I hide treats in random places around the apartment. Yet other times I just toss treats into long grass during our walks and let my dog sniff them out. Run: I’m training for a marathon, so we do a lot of running these days. Feel free to modulate the distances for you. If you’re not a runner, just replace the runs with walks. Trick Training: I have a jar full of silly tricks to teach Barley. When I’m out of ideas, I pull a piece of paper from the jar and that’s what we work on for the day. It’s a load of fun! We also go through our paces of basic obedience to keep those practical skills sharp. Come when called: I attach a 30-foot leash to my dog and work on come when called a few days per week. This vital skill could save his life, so it’s worth separating out from other training. If your dog can do one thing reliably, make it come when called. Picnic Exercise: My boyfriend and I are spending a lot of time drinking wine in parks lately. We’ll bring a fetch toy and just toss it for Barley between sips of wine. If your dog doesn’t fetch, bring along his dinner and toss it in the grass for him to root out. Hike: Also self-explanatory. I love hiking, and it’s a great way to get your dog out for new smells. Mat Training: I’m obsessed with Karen Overall’s Relaxation Protocol. I practice this with Barley while I cook dinner pretty regularly. Check out the step-by-step protocol here. Adding in some impulse control games is a great way to spice up the training. You’ll get some practical use out of it, too! Above all, just have fun with your dog. It’s ok if some days you simply don’t have time for really in-depth training. You can still exercise your dog effectively while saving time! Bring treats on your walks and do find-it games while you cook dinner. Giving your dog good mental and physical exercise does not have to be a full-time job. I love multi-tasking my dog training. Need more help figuring out how to exercise your dog? Schedule a Skype call with me! 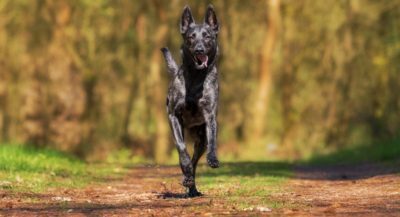 Pingback: Ask A Trainer: What's Up with Light Chasing in Dogs? Hello! I have a lovely Australian Shepard and she is very high energy! I noticed you live in Wisconsin so I was gonna ask if you had some good ideas for when the weather is to bad to go outside for dogs? We live in MN and some days it’s just really tough to find things to do when it’s snowing or so cold. Thanks! Great question, Neve! I’m lucky enough to have a dog that likes going cross-country skiing almost as much as I do. We generally go hiking through the snow or skiing a few times per week if we can. If we can’t go skiing, instead we’ll do some nosework or training games to help wear him out. We do lots of teaching him to do “doggie pushups” or jumping up/down and going through things to make it a workout!